I am grateful to have followers who visit here often. I am grateful to be a labor and delivery nurse. I find it very rewarding and sometimes very bitter-sweet. I am grateful to have a family. For some reason my linky isn't working right so go HERE to see what other bloggers are thankful for! My daughter and great authors! I am thankful for my husband, our 12 chilkdren and fabulous books to read. I am thankful for my family and our health. I know that sounds cliché but I am so blessed! For my family; thanks for the giveaway. I am thankful for my amazing, supportive family. Very thankful for good health and family. I am thankful that I have never had to deal with what pAris is. My heart goes out to them. I thankful for my husband and our two babies. I'm thankful for the education I'm pursuing. I'm thankful about my friends and family! Thank you for the giveaway! 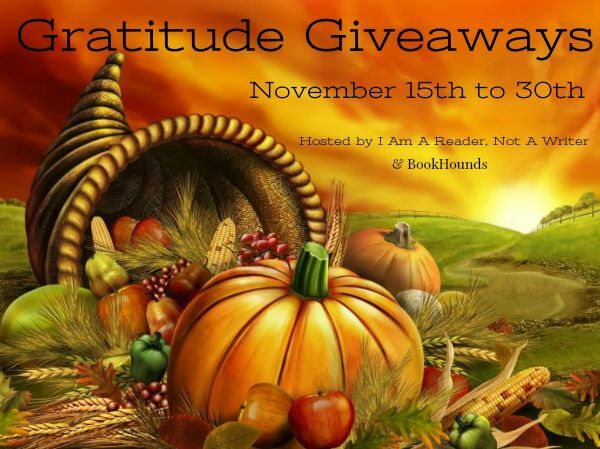 I am thankful for my family, great friends, good books, and a great bookish community! I am thankful for my neighbors and doctors this year. I'm thankful for my boyfriend of over 17 years. I wouldn't change one single day of our time together. i'm thankful for medical insurance, home cooking, and a helpful husband. I'm thankful for my family and their health and my animals. I am grateful for so many things...my family health, living in a great country, and that our holiday wishes will come true soon. My family all being healthy and happy. I am thankful for my husband, who is such a great guy, and is always so supportive of me and my kids. He works very hard to ensure we are taken care of, and is always pushing us to be the best we can be. I am thankful for my wonderful family who are always there for me. I am very thankful for my wonderful boyfriend. He has made my year wonderful! I'm thankful for good friends and good health. I am thankful for my sons and our home. I'm thankful for my loving family and cozy home! My family and pets. Thanks for the giveaway! I am most thankful for my family and our good health this year. I am thankful for my family and my good friends. For finally having a full-time job. I am thankful for the little things. A healthy family, a roof over our heads, food to eat, and gas to get to work. =] Thanks so much for the giveaway! I am thankful for my family, so very lucky to be close with them! I am very thankful for my family & friends. I'm thankful for my wonderful, and mostly perfect life. I'm very thankful for God, my family and books. I'm also grateful for all the book blogs so I can find these wonderful book recommendations. Thank you! I'm thankful for my family and our health. I am grateful to have a steady job with amazing health insurance.You definitely learn to appreciate health insurance after going without it for a few years! I'm so thankful my daughter's adoption was finalized this year! my baby boy almost 3 months old! I am thankful for my wonderful family and my fabulous friends. Waking up every morning and seeing the beautiful sunrises and my family. I'm thankful for my parents, they are amazing! I am thankful for my family, my home and my friends. I'm thankful for my family, my dog and my new car! I am thankful I am still able to walk, that my surgeries went well, for authors that give me an escape from chronic pain, and for my family. My husband and daughters are wonderful and take such good care of me. I am thankful I have them to love and be loved by. I am thankful that I did not have to have lose my foot so far. That my family is happy and healthy. I am thankful that everyone in my family is happy and healthy. I'm thankful for mother's good health! My boyfriend, my family and for being safe. I am thankful for my family and their health and happiness. As always for a job with good pay and benefits. I'm thankful for my mother and daughter. I am thankful for all the wonderful books that all the authors in my life provide to me! I'm thankful for my family, my job, and LOTS and LOTS of good books to read! I am thankful for my family, my health and my job. I'm thankful we will have had our dog for a whole year this Thanksgiving! This year and every year I am thankful for my wonderful family, food on my plate and roof over my head. I am thankful for my great health insurance! I am thankful for my four fur babies Benny, Bella, Darlin and Dolly, who keep me hopping and fill me with joy each day! I am grateful for my loving, patient and understanding husband who knows how to list my spirits up when I need it most. I am most thankful for my 3 children, and improvements in my health. I am so thankful for the amazing close knit small family I have and my friends! I'm thankful for the 8 months I had with my dad. I'm grateful for my loved ones & books! Grateful for my church family. I am thankful that my back feels great after having surgery last year. I am thankful for my husband, children (two-legged and more-legged), and the rest of my family around the world. I am also thankful for my friends, both those online and off. I am thankful for the authors in the world who create the books that bring me so much joy. I am very thankful for my wonderful family. I am thankful for my wonderful housemates and fantastic on-campus house that we took a gamble on! I am thankful for a healthy and happy family! I'm so thankful for my husband. I've never met a sweeter, kinder, funnier, more thoughtful person ever. 8 years married and it just keeps getting better and better. I am thankful for my three beautiful sons who are growing into wonderful young men. I am thankful for my family and our health! I'm thankful today and every day for my family. I am thankful for my family, especially my Mom. I'm thankful for my family, health and generous people like you who help me to feed my book addiction! Happy Thanksgiving! I'm so thankful for my husband who works hard so I can be a sahm. I am thankful for my family and that we will all be together for the holidays. I am thankful for good friends and a warm house. I am thankful for my kids, my family and my friends. Thanks for the chance! I am so thankful for my family & our good health! I am always always thankful for my family and my health! I am grateful for my children! I'm thankful for the life I was given. It's not always easy, but it is good and I'm so blessed with what I have. I'm thankful for my family, my cats and my job. I'm thankful for my awesome cats! My husband, kids, and this beautiful world we live in! Thanks for the chance. My friends and family staying healthy and happy! I am thankful for my family. I the love of others. I am thankful for being able to stay home and take care of my kids and still be able to provide for them from working at home. i am thankful for my amazing family. I'm thankful for the DVD player - we've enjoyed many movies as a family. I'm thankful for my kids! I am thankful for my family and my husband getting a good job. I am thankful for my daughter and my cats! I am thankful for my friends, family, and cat Buddy! Thanks for this amazing giveaway - I would love to win! I am grateful to have people around me who positively influence my life. I am thankful for my family, friends, followers, and furbabies. I am also thankful for a warm home, a car that runs, and good health. Happy Thanksgiving! I'm thankful for my husband and our home. I am thankful for my boys and our health. I'm thankful for my kids and grandchildren. And most of all for my wonderful hubby of 33 years. I'm thankful for my amazing family! My family especially my son! I am thankful for my new wonderful wife. I am thankful for the chance to spend Thanksgiving with my family this year. Happy Thanksgiving everyone! I'm thankful for retirement and being healthy enough to enjoy it. I am thankful we got a chance to go on some cool vacations this year, we have been working so hard we didn't go anywhere for 2 years. I'm so thankful that my mom is doing well health-wise. I am thankful for my nieces and nephew. I am Thankful for my family as well as being able to travel to see them! Thank you for the chance . I'm thankful for my family! Thanks for the giveaway! I'm thankful for my happy and healthy family! I am thankful for my husband and my love for books. I'm very thankful for my friends and family, for graduating grad school next month, and awesome books! I'm thankful for my friends. I'm thankful for my family, health and friends. I'm thankful for my family and friends. i'm thankful for my home. I'm thankful for my kitties. I'm thankful for my family, friends and country. I am thankful for my new job. I'm thankful for many things, my family the most. Thank you for the chance and Happy Holidays! I'm thankful for my health and my family. Iam thankful for a God that answers prays! I am thankful that my Dad has great doctors. I'm thankful for my family. Thanks for the chance to win! I'm thankful for friends who make an effort to hang out. I am thankful for my health and my husband. I am heatherbartley in the rafflecopter. I am thankful for my wonderful family and friends. I'm thankful that my little guy is almost 1 year cancer free and we got to spend this Thanksgiving with family and friends and not quarantined like last year! I am thankful to be feeling better. I am very grateful for my family and friends who are always there for me. Bliss Blitz Info, Giveaway + Sale News!